Moscow’s Presence in Libya Is a New Challenge for the West - The Maghreb Times ! Russian involvement in Libya is designed to establish a new zone for leverage – putting pressure on the West and on regional powers. While the attention of the West is largely focused on Russian efforts in Syria, Moscow has been strengthening its presence in other parts of the Middle East to fortify its position as a key international player. Notably, Russian involvement in the Libyan civil war has increased substantially since 2015. It provides political support and military assistance to General Khalifa Haftar, who controls the eastern part of Libya, and helped him to wreck the UN-led Libyan agreement of 2015 aimed at launching a reconciliation process. But Moscow is also involved in the diplomatic settlement of the conflict between the main factions – Haftar’s self-styled Libyan National Army and the UN-backed Government of National Accord (GNA). Neither security concerns nor economic interests explain Moscow’s increased presence in this part of the Middle East. Until recently, Russia never voiced much concern about the rise of jihadism in Libya or any potential spillover as it has in Syria. Certainly Moscow lost investments when Muammar Gaddafi’s government fell in 2011. Although the overall scale of losses is unknown, Russian arms exporter Rosoboronexport estimates its financial losses in Libya up to $6.5 billion, and Russian energy companies such as Gazprom, Lukoil Overseas and Tatneft were also either involved in or planning to invest in Libya. But this loss was still manageable. The real driving forces behind Russian involvement in Libya are a mixture of ambition, opportunism and anti-Western sentiment. First of all, the GNA is seen in the Kremlin as a Western-backed government that will ignore Russian interests in Libya if Moscow does not have its own leverage to influence the behaviour of the GNA and its sponsors. The Kremlin is concerned that if Libya is left as it is, Moscow would be excluded from participation in the crisis settlement as well as from political and economic life in post-war Libya. Connections between Haftar with the US could be re-established, especially if Haftar’s Egyptian sponsor, President Sisi, improves relations with the Americans. Consequently, Moscow has tried to position itself as Haftar’s main supporter outside the region. Russian involvement in Libya is also part of its global power games with the West. By stepping into the Libyan conflict, Moscow is demonstrating to Europe and the US that it is not ‘confined’ to Syria or Ukraine, and that its ‘success’ in Syria was not accidental. It is also about avoiding international isolation. Russia sees no reason to limit itself to supporting Haftar. It is happy to talk to all sides in the Libyan civil war. By increasing its support for Haftar while establishing good relations with GNA leader Fayez Sarraj in Tripoli and representatives of the Misratan brigades (another influential military force), Moscow is trying to assert itself as a mediator and thus create a new bargaining chip for its negotiations with the EU. This tactic is working. Analysts close to the Russian Ministry of Foreign Affairs are having unofficial consultations with European countries over Libya. And Moscow invested diplomatic effort into an early May meeting between Haftar and Sarraj, demonstrating a readiness for consensus. The unofficial signs are that, while suspicious of Russian intentions, Europe is reluctantly persuaded that it needs to talk to Moscow on this issue. However, Russian dialogue with the West requires a quid pro quo. Moscow will expect a return on its apparent flexibility on Libya – such as less pressure over its actions in Syria. In establishing a dialogue with Europe on Libya and exploiting EU concerns over migration, Moscow is trying to widen the rift within the West over their approach to Russia. It generates influence, looks for weaker players in the EU and tests their willingness to apply pressure, on Ukraine in particular. Last but not least, the Kremlin is using its involvement in Libya to strengthen cooperation with key regional players, primarily Egypt and the UAE. Some sources close to the Russian MFA have indicated that it was Egyptian President Sisi who persuaded Russia to support Haftar, and Moscow agreed to do this to flatter him. Thus, Russian-Egyptian cooperation on Libya brought substance to the dialogue between Moscow and Cairo. The Libyan adventure is cheap. Haftar visited Moscow three times (though only two meetings were officially confirmed by the Russian authorities) in 2016 and Russia is believed to be supplying him with weapons and printing bank notes for the Libyan central bank in the Haftar-controlled territories. Yet, according to some Russian military experts, Russian weapons are delivered to Haftar by Moldovan air-companies – with logistical help from Egypt and financial support from the UAE. Moscow is effectively just opening its weapons warehouses and issuing export permits. By establishing contacts with other players, Moscow is also minimizing its exposure to risk: Haftar is its biggest bet in Libya, but not its only one. The Kremlin has been frustrated by Haftar’s past refusals to meet with his political opponents as well as by his ambitions to become a ‘second Gaddafi’, attempting to put the whole of Libya under his sole control. Moscow is concerned that Haftar is may be trying to improve his relations with Saudi Arabia by allowing Saudi-supported Salafi preachers to work in Libyan territories under his control and incorporating Salfist groupings into his army. 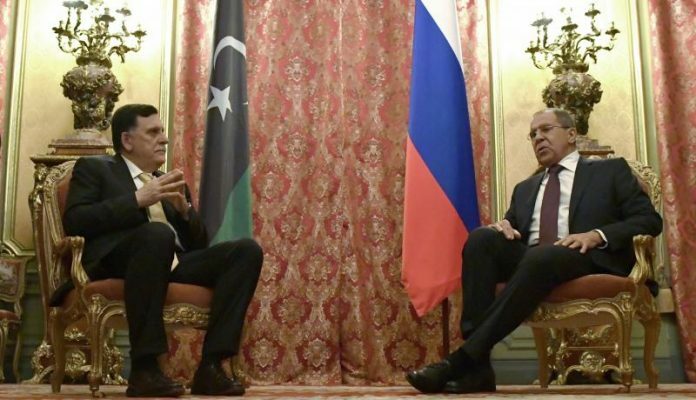 Under these circumstances, Russian contacts with Sarraj and his GNA government constitute a plan B – to insure that, if necessary, Moscow can switch favourites and still ensure its presence in post-conflict Libya. Russia has considerable freedom of manoeuvre in Libya. The US does not want to get deeply involved, whereas Moscow has both a stick and a carrot: it can offer its help as a mediator or it can provoke further conflict. Its assistance has certainly made Haftar more influential. Russian efforts to bridge relations between factions in Libya and its apparent openness to dialogue with the EU suggest that Moscow prefers the carrot option. However, the West should be prepared for the Kremlin asking a high price for its help. Previous articleAs Many as 30 Migrants From Libya Feared Dead as Mediterranean Toll Tops 1,700: U.N.